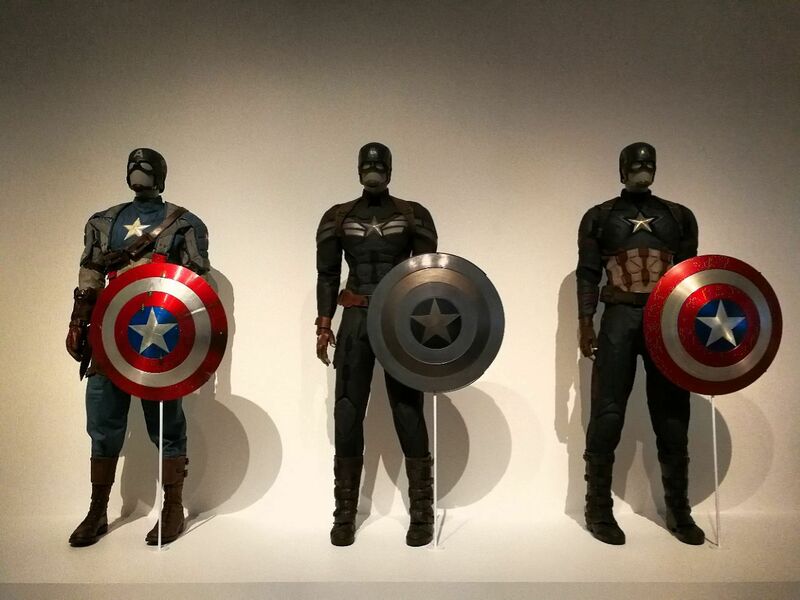 Avengers, it’s time to Assemble Down Under, in Queensland. 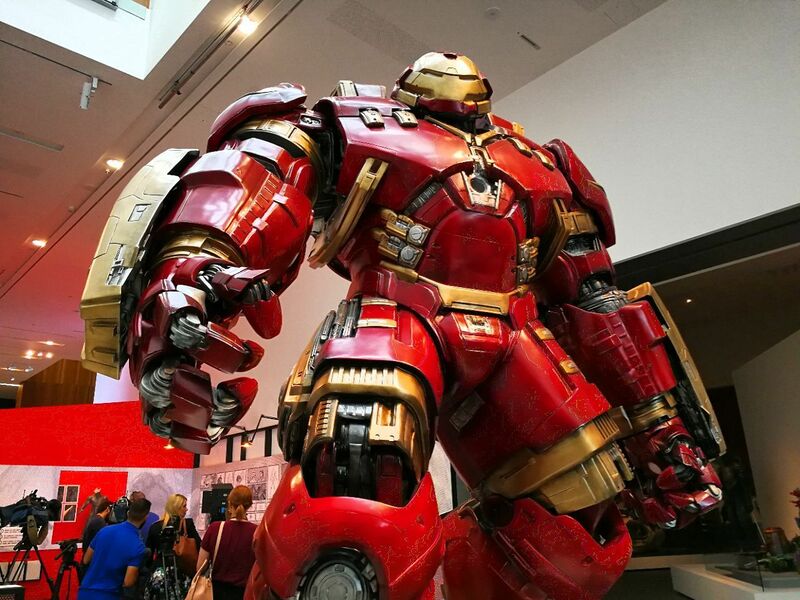 Marvel: Creating The Cinematic Universe is a massive exhibition that is a must-visit for any Marvel maniac, for both comic book and big screen fanatics.. The exhibition at the Queensland Art Gallery | Gallery of Modern Art (QAGOMA) is a massive collection of Marvel movie memorabilia, props, costumes and behind-the-scenes sketches and storyboards. There are over 500 objects on display, including over 60 original costumes worn by the MCU actors, such as Chris Hemsworth and Robert Downey Jr. It’s so huge that it is being regarded as the largest Marvel art exhibition in any museum in the world. 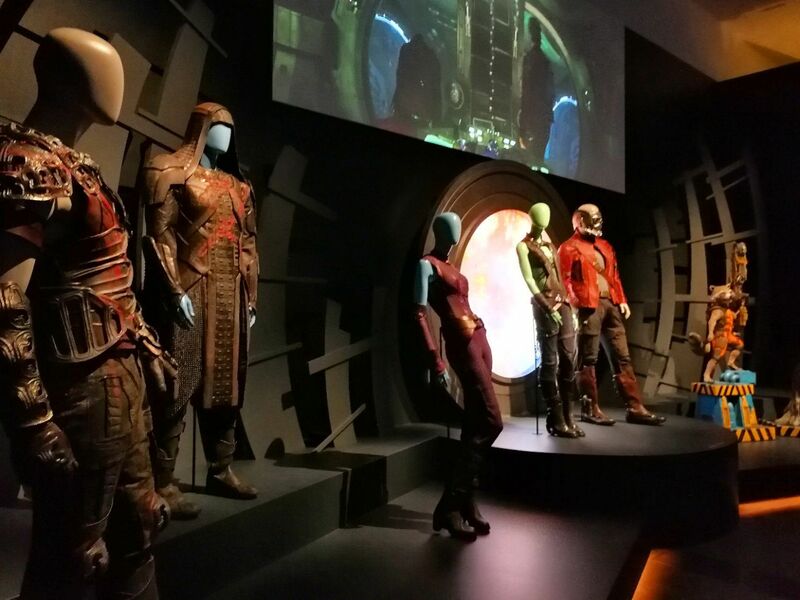 The show, which is on from May 27 to Sept 3, also includes a number of exhibits from the upcoming Thor: Ragnarok movie, which is due to hit screens in November this year. 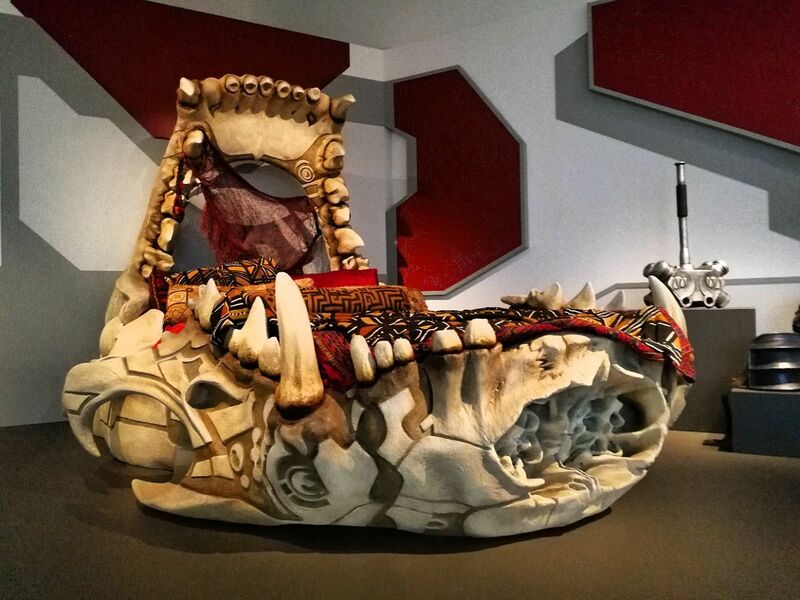 You can check out props such as Hulk’s bed (yep, and you thought that only Romanov got to see it didn’t you?) and weapons, as well as concept artwork for the film. It’s pretty exciting seeing stuff from a movie that’s still in production – I know I’m going to be looking out for those props on screen later. 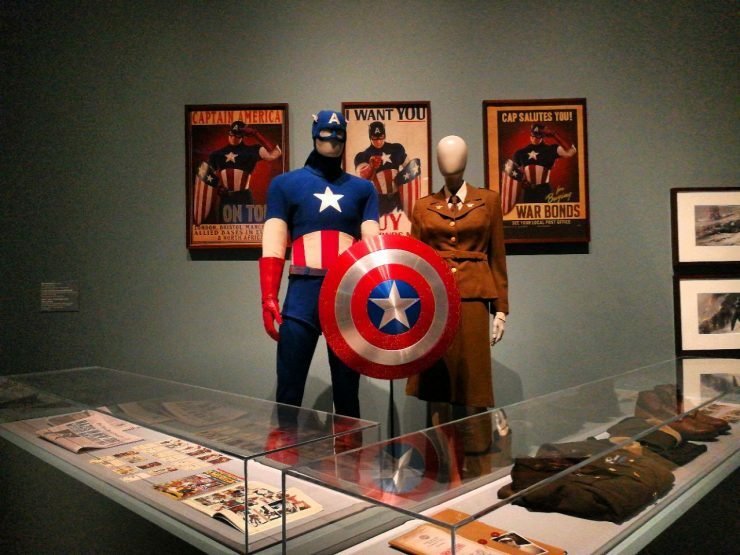 Because the collection is housed in an art museum, it’s quite different from something like Marvel’s Avengers STATION, which was more interactive and kid-friendly. 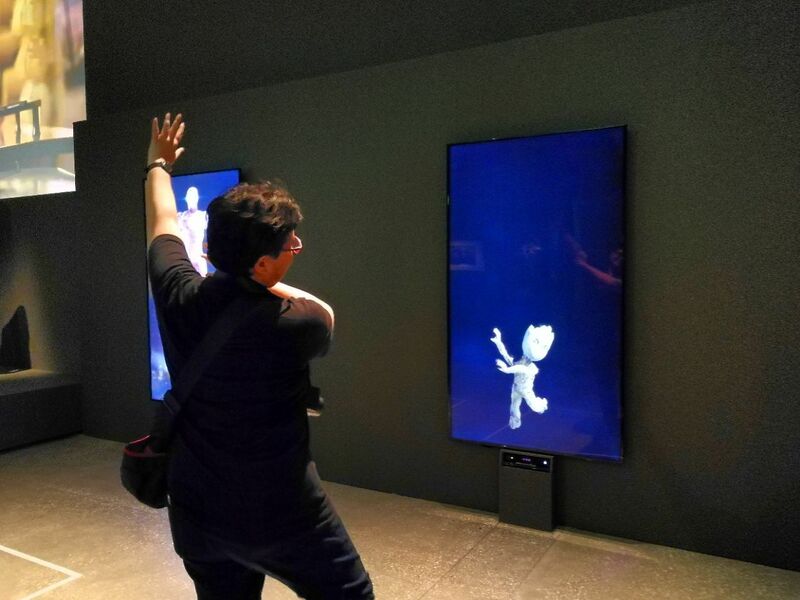 The show at QAGOMA is a lot less hands-on, and many of the exhibits are signboarded as “Do Not Touch”. This may seem a little incongruous to the usual bang and blast of superhero movies, but I think it works. 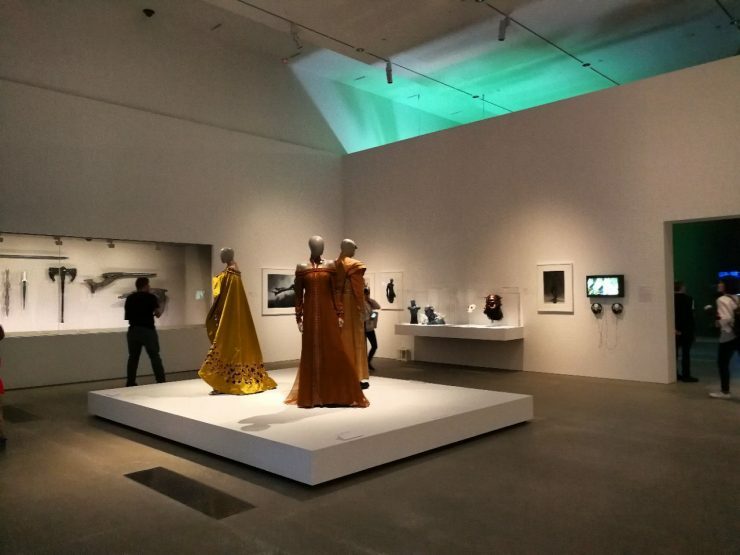 The curatorial eye does make the exhibition quite stunning visually, and highlights the care and detail that goes into each piece. The exhibition is split into three parts: The Cinematic Assembled, Decoding The Universe, and Behind The Scenes. Here’s a quick walkthrough of what’s what. This is probably the largest, as well as the most fun and photo-worthy section of the three. 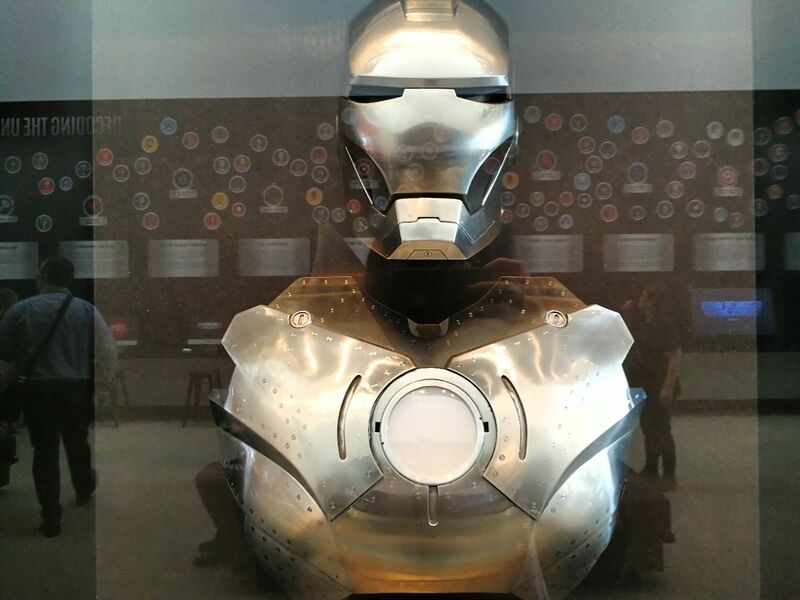 It’s mostly props and costumes from recent Marvel movies, as well as explanations of each film/universe. 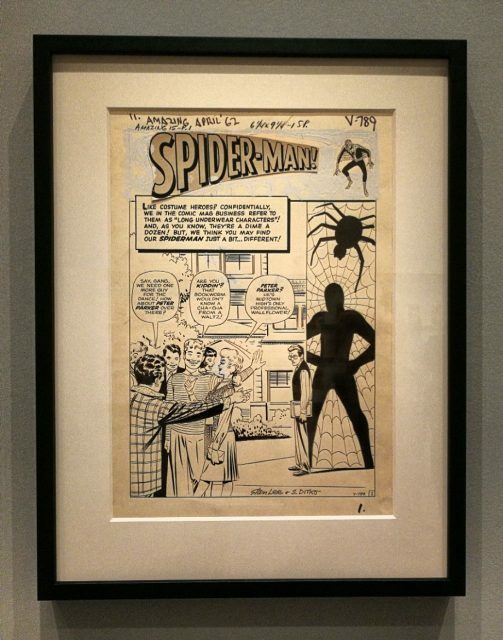 When you walk in, you’re greeted with a working copy of Spider-Man’s very first comic book appearance, in April 1962. This is quite rare, as these draft copies were considered pretty much trash or junk, and were often thrown away. 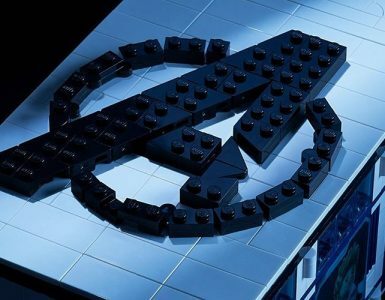 See, we told you it was for the comic book geeks as well. In the next room, you get a ton of stuff from both the Avengers movies, The Avengers (2012) and Avengers: Age of Ultron (2015). 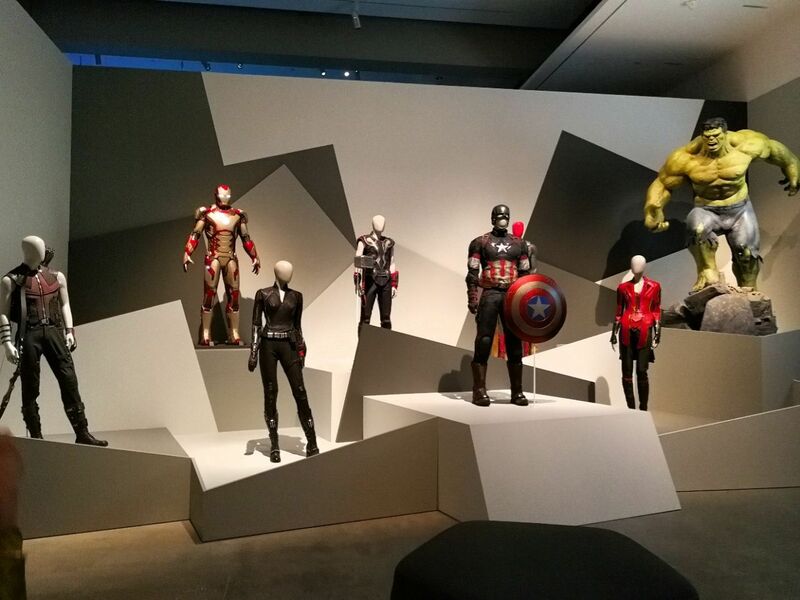 There are costumes worn by Black Widow, Hawkeye and Vision, as well as a replica of the Hulk. 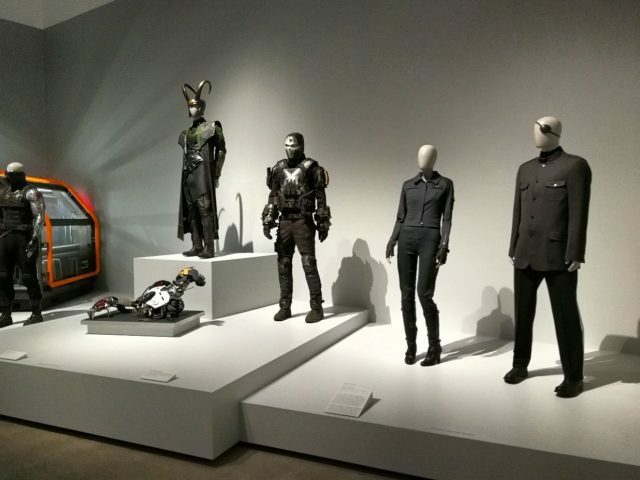 On the other side, you have the Winter Soldier’s chambers, as well as outfits for Loki and Nick Fury. Yes, that’s the Hulk right there, because showing us an oversized pair of torn pants makes no sense. 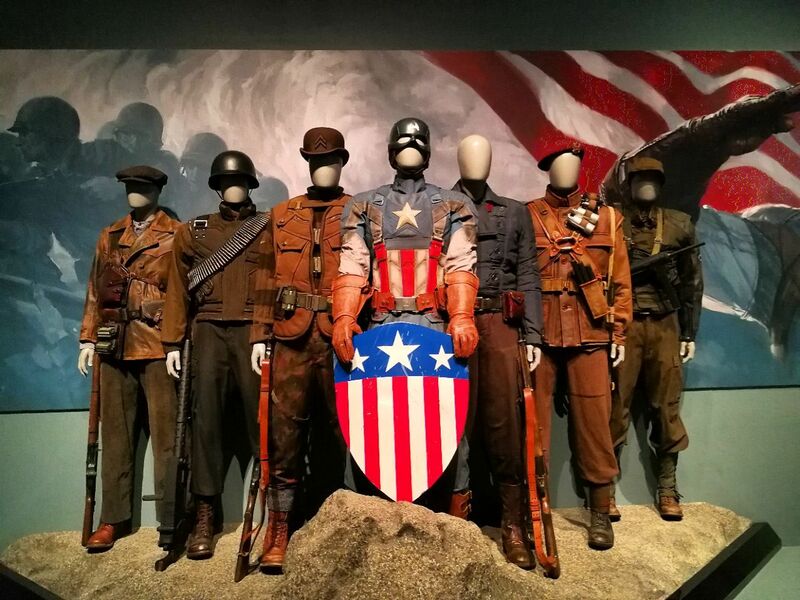 Next, we get a whole space dedicated to the golden boy, Captain America. 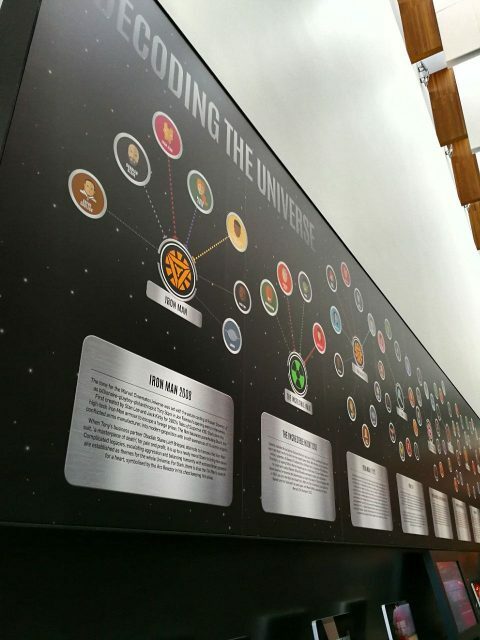 Or, as the writeup on the wall calls him, the “moral epicentre of the Marvel Universe”. The layout of this section takes its cue from Washington DC’s Smithsonian National Air and Space Museum in Captain America: The Winter Soldier (2014), and charts his growth from “Skinny Steve” to a lean, mean fighting machine. Yum…. Fans of Guardians of the Galaxy and Dr. Strange may feel a little slighted here, as highlights from both the movies are combined into a single room. 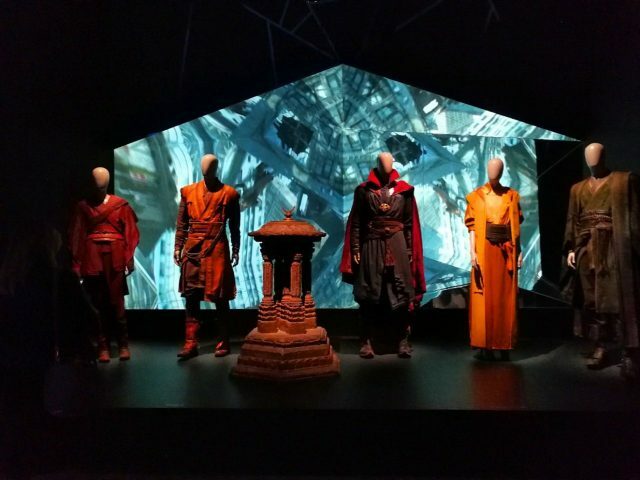 That’s not to take anything away from the displays though, as the mirror-filled, trippy Dr Strange stage is definitely one of the more atmospheric ones in the exhibition. Wait. 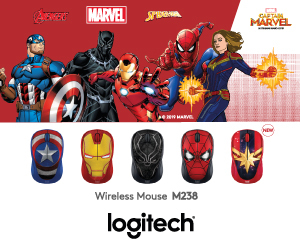 Who took the Eye of Agamotto? 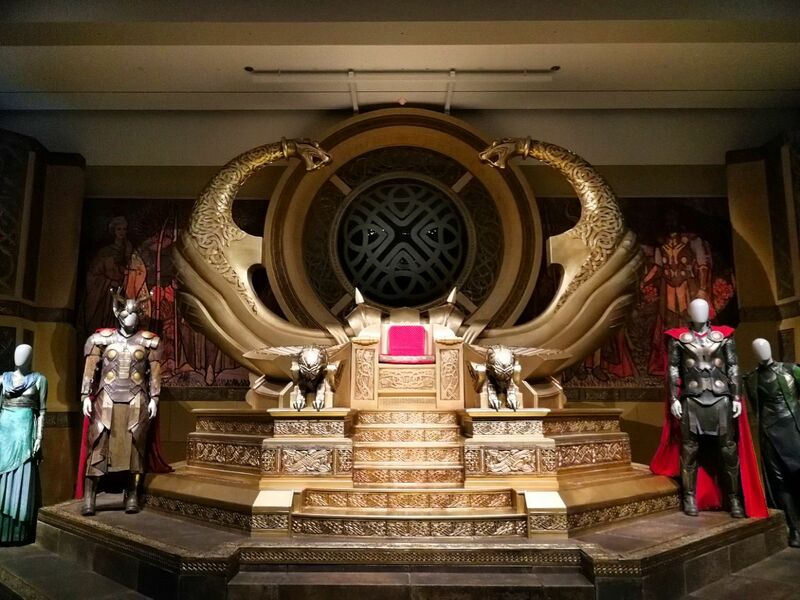 The highlight of this first segment though, for sure, is a reconstruction of the Asgard throne room, with soaring golden arches and intricately detailed steps. Although you can’t climb up and sit on the throne, you can get within poking distance of the costumed mannequins that are flanking it. 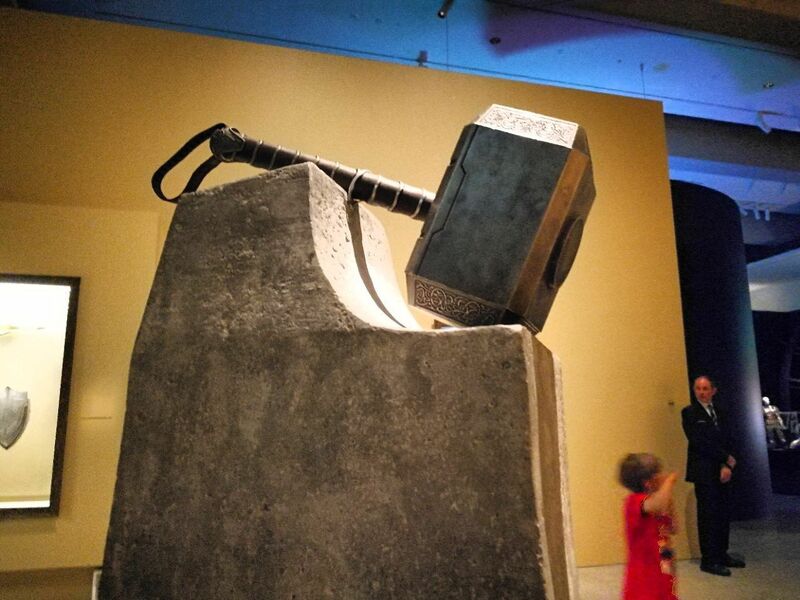 There is also Thor’s hammer, Mjolnir, but unlike at the Marvel’s Avengers STATION exhibition, you can’t try lifting this one up. Instead, you’ll have to be content with snapping pictures from a couple of feet away. This second segment is the shortest of the three, and also the most information-heavy. The dominant exhibit is a long timeline stretching across the hall, which details a chronology of every Marvel movie from Iron Man (2008), to Thor: Ragnarok (2017). 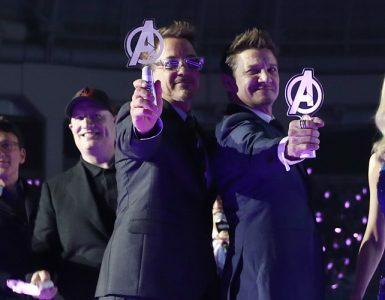 Sorry kids, but nothing for Avengers: Infinity War. As this also doubles up as the Iron Man section, visitors can also check out a variety of Iron Man suits and busts. There’s also a small section on Tony Stark’s inventions, including early versions of the Arc Reactor that keeps him alive. Quick. 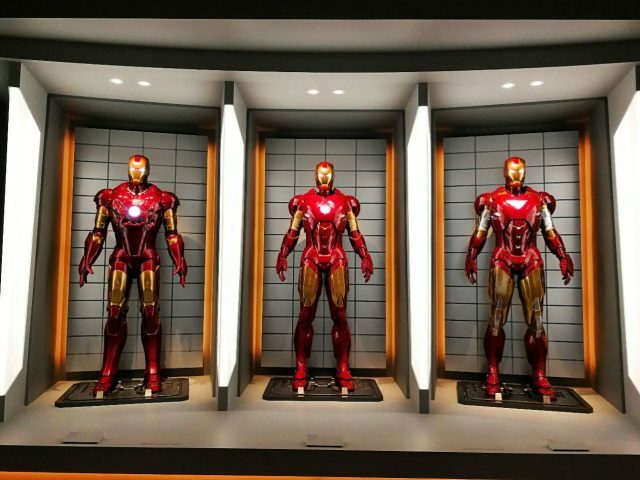 Tell me the Mark designation of these three suits! 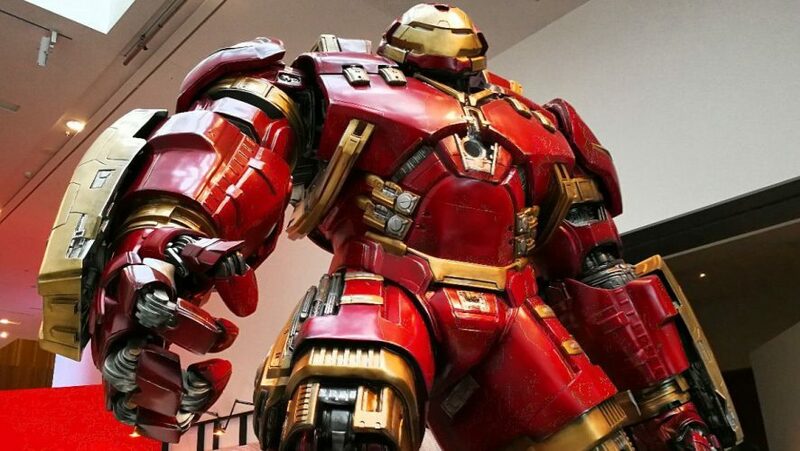 At the end of the hall, there’s a giant Hulkbuster! 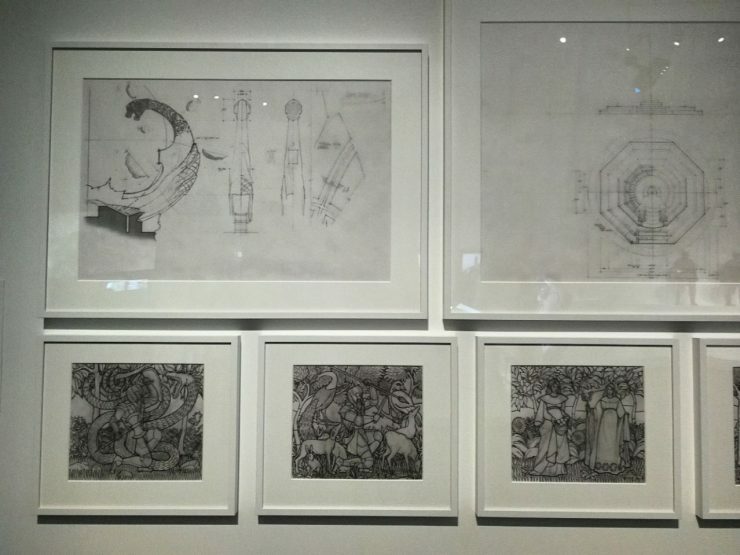 This is probably the single biggest piece in the whole exhibition. 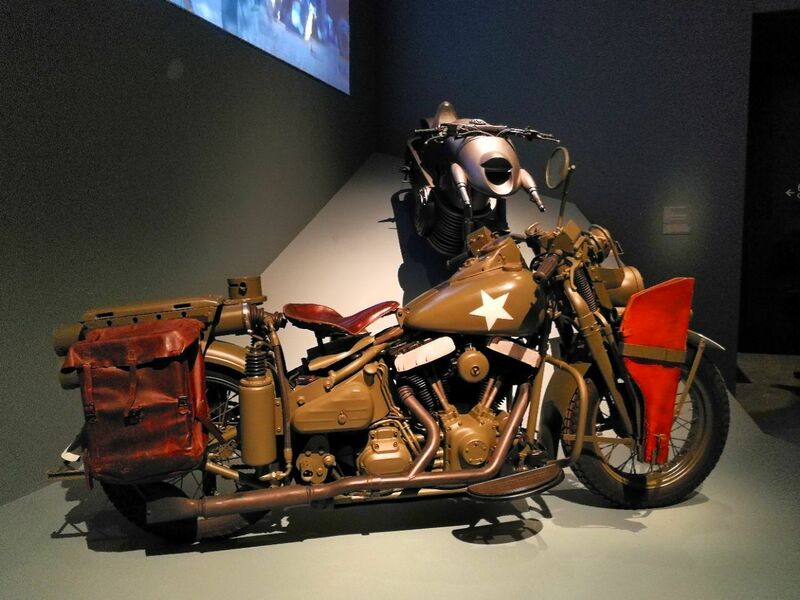 It’s apparently made up of about a thousand small pieces, and each time it’s moved, it has to be disassembled and reassembled. 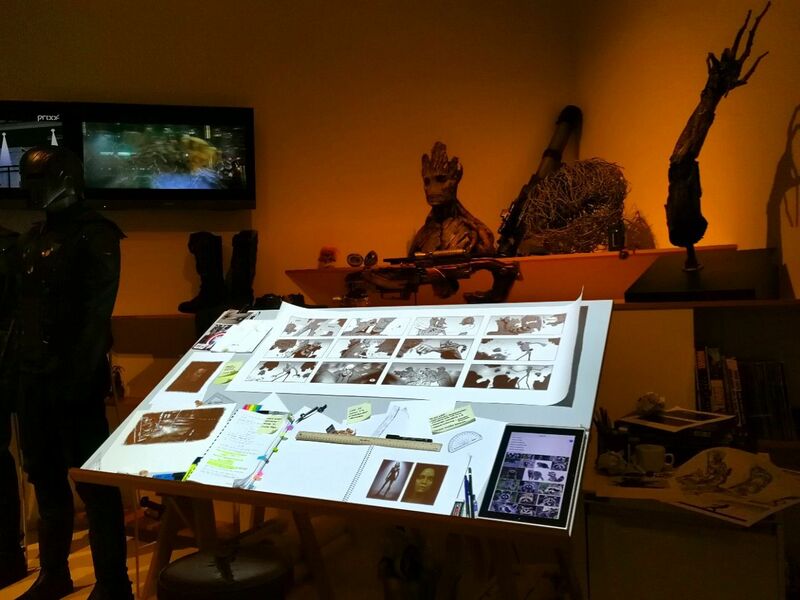 This last section has info about the pre- and post-production process, with exhibits like storyboards, sketches and reference comic books. There’s also a section on motion capture and green screens. It also contains the most stuff about the upcoming Thor: Ragnarok movie. Right as you walk in, you see Hulk’s giant bed, which looks like a giant skull with teeth for bedposts. I’m not quite sure what goes on there, but it looks pretty wild. 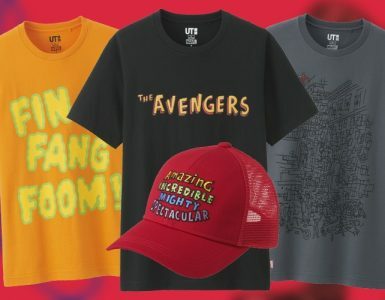 Ok, since the movie is not out yet, we don’t have to tell you: SPOILERS AHEAD! 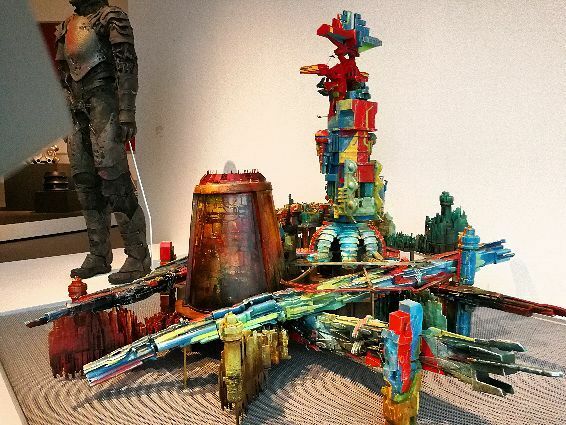 There’s also a model of Sakaar’s capital city, which was painted by two Queensland-based artists. This, along with some of the sketches and drawings available, provides a nice bit of insight into the upcoming film. The post-production section is the only interactive part of the whole exhibition, and demonstrates how motion capture can be used to make your favourite Marvel superhero mimic your real-life movements. Stand in front of a camera, and after a slight bit of processing, you’ll be able to make Groot or Iron Man do the macarena. 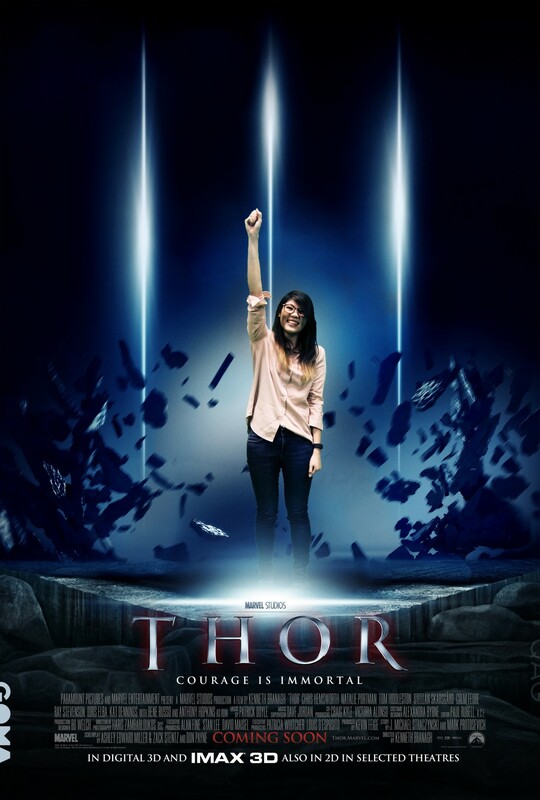 Just before you leave the exhibition, you can get your picture taken in front of a green screen, and worked into one of the Marvel movie posters! You get to e-mail a soft copy to yourself as well, to share or post anywhere you want. It’s Hammer Time. Wait, am I not worthy? 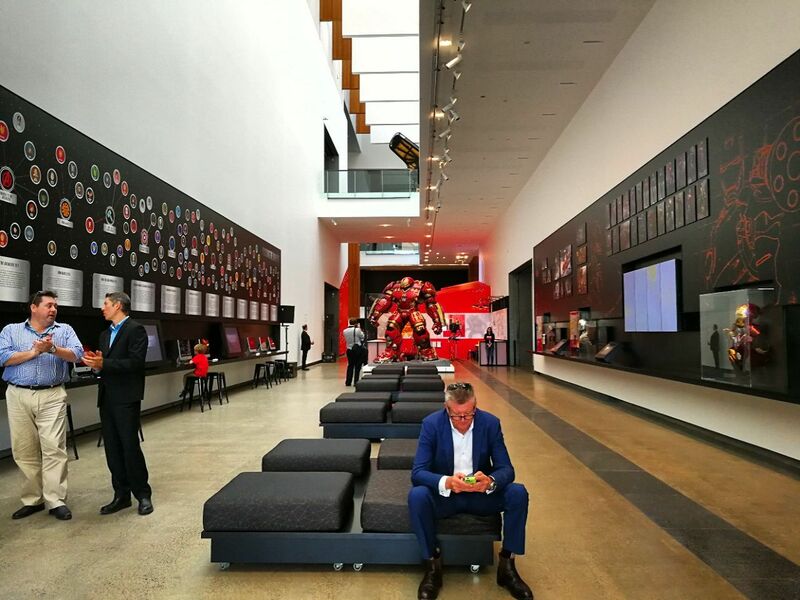 At a good clip, it’ll probably take you at least two hours to cover the whole exhibition. 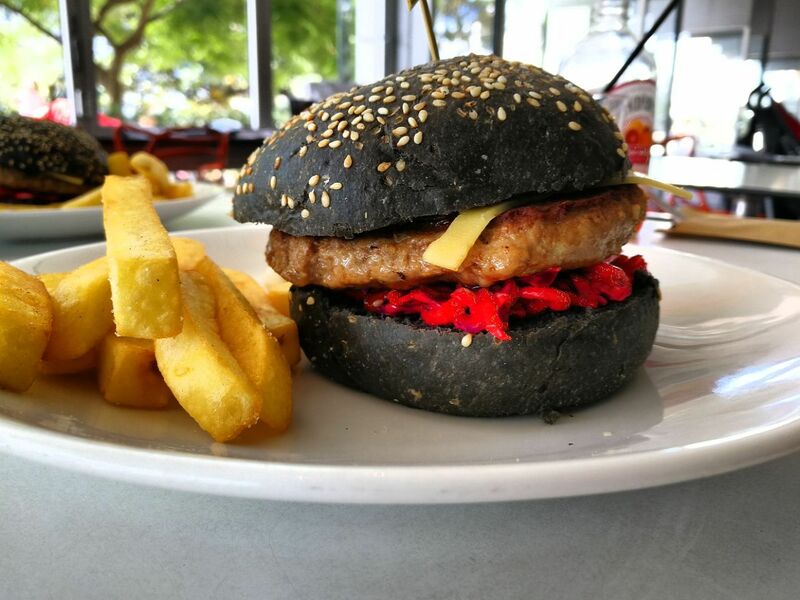 Once you’re done, you can drop by the GOMA Cafe Bistro, which overlooks the Brisbane River. In conjunction with the exhibition, the cafe has created a special Villain Burger (AUD$18), which has an Angus beef patty, red cabbage slaw, roasted peppers and cheese on a charcoal sesame bun. 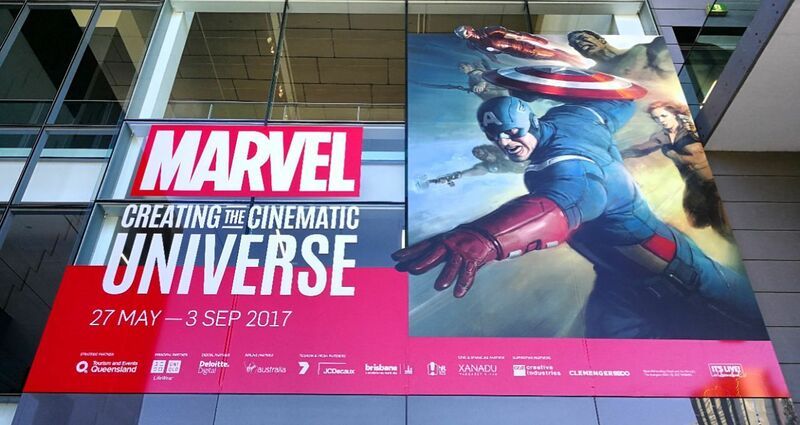 Marvel: Creating The Cinematic Universe is on from now until September 3. Tickets: Adult $25, Concession $20, Children (5-12) $10 and Member $18. Family (two adults and 3 children 5-12) $60. Hours: Open daily from 10am to 5pm. Open from 12 on Anzac Day. Closed on Good Friday, Christmas and Boxing Day. 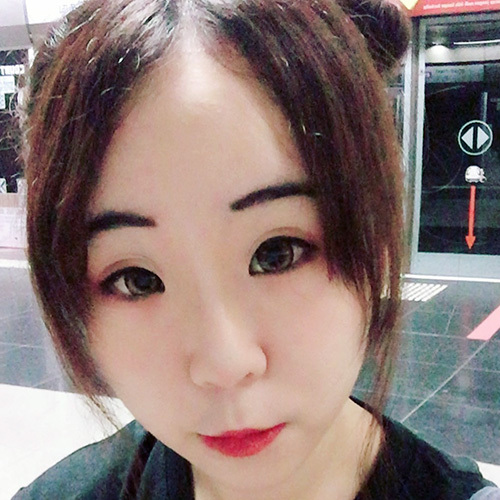 Lisabel is a former tech journalist who loves mechanical keyboards, sneakers, capoeira and cheesy puns. She has dreams of being the next Masterchef, but so far all she has produced is a bunch of Play-Doh pasta.